In serving mankind, organists are involved in a unique ministry, and being given the privilege of providing the musical accompaniment for a fraternal organization's ceremonies and work can be a very satisfying and rewarding part of that experience. It also poses its own unique set of challenges which the musician is less likely to encounter in other performing situations. One of these challenges, and perhaps the hardest thing to get used to, are the occasional and unexpected deviations from the plan that the musician was given to understand would be followed in the performance of the ritual. It's inevitable, when we're dealing with people, that situations may arise at times where the leader in charge or maybe someone in the ritual cast begins to ad lib and take off in a different direction without taking into account what this does to the music in tow. The musical accompaniment for the ritual (the degrees or orders being likened to a morality play with a cast, prescribed parts, props, and floor work) has been carefully prepared in advance by the organist to match every movement and time requirement; when someone changes that movement and time requirement in the middle of a conferral (this is destined to happen, sooner or later) it leaves the musician in free fall as to how to handle it. This creates a sudden need for the musician to become a mind reader with their eyes and attention focused on the floor at the same time that they're having to keep their focus on a hundred other things -- those who read this blog are well aware that getting the organ to play is way more than just reading notes off a page. This is hugely distracting; within just a couple of seconds fraternal musicians can find themselves thrust somewhere into a place where they worked hard to keep from being. The average person doesn't have a clue what goes into organ playing, that it jealously requires the player's full and focused concentration, that distractions from that will lead to mistakes; mistakes, in their turn, can distract an organist further, leading to more mistakes. These kinds of happenings are not unique to fraternal organists; they can happen to church organists, too (although probably less frequently) ... such as if the pastor would change a hymn to be sung for the worship service without managing to tell the organist in advance (yes, it's happened before -- pastors are human, they've got more than one thing on their mind too, and oversights do occur) and the organist first learns of it when it's announced to the congregation at the moment the singing is to commence. When things happen like this that weren't supposed to happen, it's jarring but important to remember that, no matter how the musician handles it, no one's life is at stake, no one will get injured, no property will get damaged -- nevertheless it takes some very quick thinking, the ability to multi-task with moment to moment adjustment, a ferocious concentration, and a sharpened ability to improvise and adapt the music to fit a new time requirement on the spot in order to recover and salvage the situation. It's even more awkward when this happens at the very end of a long, impressive degree when the musician plays the big finish, the curtain comes down musically when and where it was agreed upon in advance, and, lo and behold, the cast is still continuing to move about, making laps around the whole room. What does the musician do when this happens? Let the cast continue their perambulations in dead silence until they make up their minds to stop? Take a stab at continuing with music? If so, is it the same music that was just played? With the same sound, or some other sound? Louder or softer? Is it repeated, note for note? Paraphrased? From the beginning or someplace in the middle? If so, where in the middle? Should it be improvised? If so, is it going to be based upon what was just heard or entirely different? How long will this take? ... 15 seconds? 45 seconds? 10 seconds? A minute and a half? The musician, poor soul, has none of this to go on; it's unsettling not having an idea about what or where or how to begin playing knowing it may have to be terminated at any moment; it isn't fair to expect this of even a seasoned musician, but, then again, nobody ever said the world was a fair place. 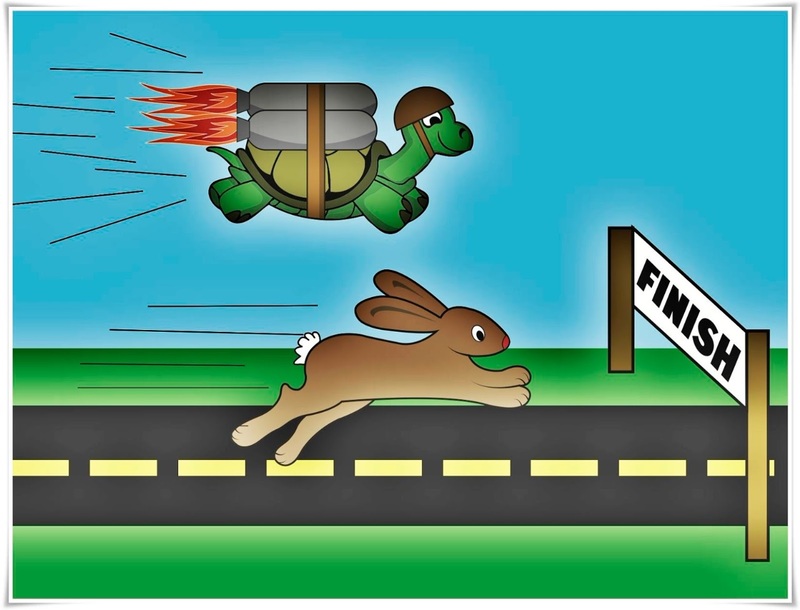 Organists who find themselves in moments like these are expected to deal with a whole series of alternatives and within a split of a second choose the best one that will work in that situation; these are the times when they're like a hare trying to keep up with a rocket-powered tortoise (photo); that same hare might be the most sure-footed rabbit to ever run the track, but its very vulnerable here to losing its balance and taking a spill. Every organist who performs with a team on the floor is going to find themselves, at times, either in a taffy pull or a cancel game like this, having to stretch the music further or cut it off before it plays out, in order to fit a time requirement that wasn't anticipated. One way, perhaps the most reliable way, to prepare for those kinds of situations is, if the musician knows what they're going to be performing beforehand, to practice that same music by introducing those same types of interruptions or extensions in mind; this, if nothing else, will get the organist a little more used to dealing with things like this, if and when they occur. Selection of the right music in advance will help the organist gauge how long they must play and match the tempo accordingly; for example, if there is to be music while a candidate circles the room one time before stopping, a 4 line standard hymn may be chosen and performed so that, with each line of the hymn, the candidate is another quarter of the way around the room. It's plain to see that, in this same situation, longer songs or hymns such as Great Is Thy Faithfulness, How Great Thou Art, or A Mighty Fortress would not make a good fit here; neither would any other music which would suffer violence if only partially played. Even when there's an awareness on the part of the cast or leader in charge to try to prevent deviations from happening, the fraternal musician should still expect to encounter them and be prepared to recover to the best of their ability. The fraternal organist may also encounter unavoidable delays for a few minutes during which time the cast is outside the room getting into costuming and make-up, locating paraphernalia, asking any last minute questions, giving or receiving instructions, etc. ; the musician could make this time pass better for the candidates and members seated inside by playing something for them during these intervals. The problem with this is, the musician inside the room, at that time, will have both eyes glued on a door about to open any second for all he knows, and he doesn't want to get launched on 2 verses of a hymn with an intervening interlude only to realize that the music must promptly cease, perhaps even in mid-phrase, because the cast, oblivious to what's going on inside the room musically, has decided that this is the time to begin. And so, the men sitting inside the room patiently waiting for the next scene in the degree can find themselves enduring a boring silence for a few minutes between scenes, often wondering why the musician doesn't have the sense to rescue them from it by playing something to fill up the time; they don't know and don't suspect that the organist typically is trained to fill up an entire hour without pause, if need be, but just doesn't want to risk doing violence to the music by having to press the delete button on themselves as soon as they get started; none of this usually occurs to the men seated there; all they know is, they're bored. Bottom line: until such time as fraternal organists can read minds and start seeing through doors they'll simply have to be content with dealing with a few frustrations, being patient with others, striving for excellence instead of perfection, taking their disappointments in stride, learning to laugh at their mistakes, being kind to themselves, and realizing that all of this and much, much, more is bound up with that same calling that first beckoned them to seat themselves on an organ bench.